Is making Akamu, Ogi or Pap still dealing with you? Your village people have sworn that you can never get this Akamu right so they will continue to laugh at you? Don't worry, I've got your back because I have a permanent solution on this page for you. Make sure you read till the end to see the common reasons why your akamu is watery. If all else fails, do you know that you can also use corn flour or corn starch to make akamu? For those in Nigeria, by corn flour I mean the VERY fine corn flour, the one that is like powder, not the rough one for making alibo. Click here to see how to do that. The only difference is that it MAY not have the sour taste of akamu. I also have a hack for getting the sour taste on that page. Traditionally processed Ogi, Akamu or Pap with the distinctive sour taste is a great partner to Fried Plantain, Nigerian Pancake, Akara, Fried Yam, Puff Puff etc. Any of these when combined with Akamu, makes a great breakfast meal. Akamu is also a great baby food. Akamu is simple yet very difficult to prepare. It is a big challenge for a lot of people. In Nigeria, we usually add evaporated milk to Akamu meals so the main requirement is that the akamu/ogi/pap is thick after preparation so that when the milk is added, a perfect consistency will be achieved. On this page, I will discuss how to prepare the meal for breakfast. If you are looking for how to process Akamu/Ogi/Pap from corn, click here. If you can't buy or make Akamu from scratch, you can use corn starch (corn flour) but the classic sour taste will be missing. Click here to learn how to hack the sour taste into the corn flour akamu. 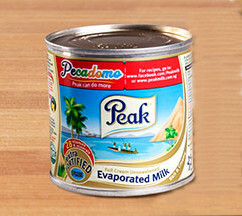 Peak Milk (evaporated) is the best milk for akamu because it is creamy and its unique taste works well with the sour taste of akamu/ogi. Whole milk, semi-skimmed or skimmed milk are not great for akamu. 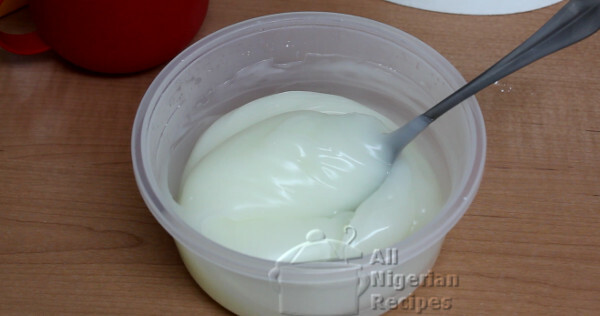 If making Akamu for your baby, use baby milk. Add sugar to your taste. I have never used other sweeteners in Akamu. For babies, do not add sugar. Put some lumps of akamu/ogi/pap into a sizeable bowl. Akamu rises during preparation so you should use a bowl big enough to contain the meal in its risen state. If in doubt, use a very big bowl, with time, you will learn which quantity can comfortably fit is which bowl size. Use a tablespoon to crush the lumps of ogi into very small pieces. Add cool water in small quantities and mix till you have a medium consistency with no lumps. Your aim should be to mix the akamu as thick as possible. See the video below. Put a kettle of water to boil. Make sure the water will be enough. It is better to boil too much water than not have enough water when making akamu. Just before the water boils, stir the mix very well because some of the ogi may have settled at the bottom of the bowl. If not stirred well, this is the major cause of lumps when you start making it. Once the water boils, pour it slowly but steadily in a circular motion into the bowl of akamu and stir at the same time. Pouring the hot water slowly and stirring at the same is very important because this prevents lumps. Once you see the mixture setting, stop stirring and reduce the flow of water you are pouring till the akamu has completely set. Set the kettle aside and stir the pap very well. If it is too thick for you, you can add more hot water. But be careful else it will become watery. Remember that you will still add liquid evaporated milk. Add peak evaporated milk and some sugar to taste and stir everything to the way you like it. It was watery when you mixed it with cool water. You did not wait for the water to boil. You did not pour enough hot water. Lots of people due to fear, often do not add enough hot water. When you start adding hot water, the mix will get watery before it thickens, that's the great science of akamu. So let go of fear and make sure you add enough hot water. Once you got the cool water mix right, and once number 5 did not happen to the akamu, do not fear, it will thciken. Your akamu is not at room temperature when you are trying to make it. You brought the akamu out of the fridge or freezer, mixed immediately and tried to make akamu with it. If the akamu mix is too cold, the hot water, no mater how hot will not be enough to set the akamu. Best practice is bring your akamu out of the fridge the night before and keep it in the kitchen then make in the morning. If you store your akamu in the freezer, bring it out at least 24 hours before you make the akamu. By doing this, the akamu will be at room tenperature at the time you want to make it. The akamu came in contact with salt when it was being processed into corn. Salt is akamu's greatest enemy. So salt found its way into the akamu while it was being processed from corn, then the whole batch of akamu will be affected. Akamu made with dawa is usually a challenging one to make, it is always more watery than akamu made with corn. This is because dawa does not have as much starch as corn. I would even avoid akamu proceed from 100 percent dawa. If I was make akamu with dawa, it is better to mix it with corn to improve the starch. This is an extra tip: when making akamu for a large crowd, do not make the akamu in one BIG pan rather make several batches in smallwer bowls, that way you have more control.